Use the Schedule Settings dialog box to panel to configure how and when to run the schedule, and the behavior if an error is detected. Tap next to the Schedule name on the Schedule tab to open this dialog box. Immediate: Data is acquired when the schedule is run. Date/Time: Data is acquired when a specified date and time is met. 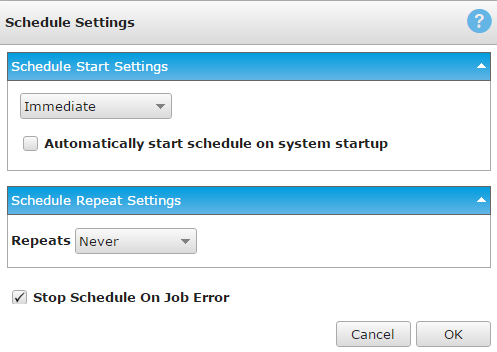 Automatically start schedule on system startup Enable this checkbox to run the schedule when the WebDAQ is powered on. Never: The schedule runs once. Consecutively: Run repeatedly until the End value is met. Enter the number of times to repeat the schedule, or choose Never to run repeatedly until manually stopped. Hourly: The schedule runs every hour for the specified number of hours; choose Never to run every hour until manually stopped. Daily: The schedule runs every 24 hours for the specified number of days; choose Never to run every 24 hours until manually stopped. Weekly: The schedule runs every 7 days for the specified number of weeks; choose Never to run every 7 days until manually stopped. Custom: The schedule runs at user-specified intervals and duration. Stop Schedule on Job Error Enable this checkbox to stop running the schedule and to cancel any remaining scheduled jobs if an error condition is detected. This checkbox is enabled by default. Tap OK to save the the schedule settings.